(CNN) -- Tens of thousands of people packed a soccer stadium in Cameroon Thursday, including President Paul Biya and his wife, for the first large-scale mass of Pope Benedict XVI's first visit to Africa. Tens of thousands of people gathered at a football stadium in Cameroon to see the pope. Africa is the last continent that Benedict had left to visit, and one he could not avoid, said David Gibson, a biographer of the pope. "He knows he has to do this. 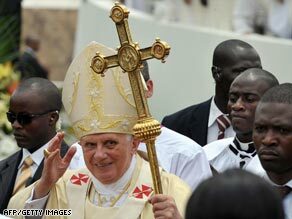 He knows Africa is the future of the (Roman Catholic) Church, as it is for all of Christianity," said Gibson. Christianity, like Islam, is on the rise in Africa and Latin America, even as the northern hemisphere tends to become more secular." One in five of the world's Christians lives in Africa -- up from less than one in fifty in 1900, said Brian Grim, an editor of the World Religion Database. So Benedict is making the visit although travel "is not his cup of tea," Gibson said. But Benedict understands that travel has become an essential part of a pope's duties, said Gibson, the author of "The Rule of Benedict: Pope Benedict XVI and His Battle with the Modern World." Benedict drew cheers at the mass at the 40,000-seat Amadou Ahidjo Stadium when he told worshippers that God had not forgotten orphans, poor and abused children, and those "forced to join paramilitary forces," Cameroon TV reported. He did not mention condoms, a subject which sparked controversy when he reiterated the Vatican's opposition to artificial birth control Monday while flying to Cameroon. The pope's mention of birth control may have been an effort to draw attention to the trip, which "is not getting much of a bounce in the Western media," Gibson speculated. "They are savvy enough to know that if the pope mentions condoms, it is going to be a headline," he said of the pontiff's advisers. The issue did not come up by chance, he pointed out. "These were pre-selected questions for which they had prepared answers," he said. The pope also Thursday met local Muslim leaders in Cameroon, a west African country which is just over one-quarter Roman Catholic and just under one-quarter Muslim. Both religions are expanding rapidly in Africa, said Grim, a senior research fellow in religion and world affairs at the Pew Forum on Religion & Public Life. Less than one in ten people in sub-Saharan Africa was Christian in 1900. Today nearly six in ten are, he said. The region was about 14 percent Muslim at the beginning of the 20th century, he said, and about 30 percent Muslim now. Benedict outraged Muslim leaders around the world in 2006 by quoting the 15th-century Byzantine emperor Manuel II Paleologus when he said, "Show me just what Mohammed brought that was new, and there you will find things only evil and inhuman, such as his command to spread by the sword the faith he preached." He repeatedly apologized for the citation, which he said did not reflect his own views. "It was a painful lesson but clearly the pope learned something from that," Gibson said. The pope's meeting Muslim leaders in person can help relations between the Church and Islam, the analyst added. Face-to-face encounters make "the pope a human figure. That's what these trips are really about -- to see that the pope is not the boogeyman, he is someone who is kind and wise and wants to discuss issues. "It's so easy to see caricatures, so for the pope simply to show up can be an enormously positive development," Gibson said. Gibson said this week's visit may be Benedict's only trip to Africa. "Knowing that the pope is older, he cannot travel as much -- he does not like to travel -- makes these trips more poignant. He may never come back to Africa again."